Autumn in Korea is my favorite time in the country. The weather is cooler and less humid, which makes hiking so much more pleasant than during parts of the Korean summer when the humidity makes you feel like you just took a shower after stepping outside, and sometimes the monsoon rains gives you a real shower. 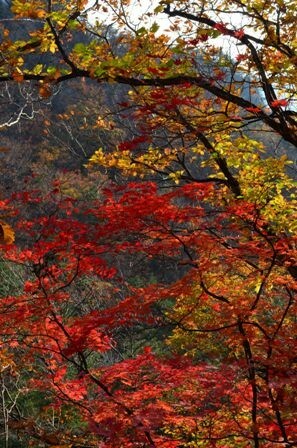 But most of all, the reason I love Korean autumns is that the landscape come alive with bright, beautiful colors. Korea is a very mountainous country and there are numerous forests populated with trees that change color and foliage for the seasons. These bright colors of nature inspire me to create art. The art my eye is drawn to, either as a viewer of art or as a creator of art, is bright and colorful paintings. I’ve never been a fan of dark, dreary realist paintings and preferred paintings that pop with color. Likewise the art I want to make is the colorful world around me. This makes autumns the perfect time to capture images to create paintings later. The mediums I used for this painting were a watercolor under painting in greens and browns, watercolor pencil for the trees, and hard pastels for the foliage. I felt the combination of mediums would be ideal to achieve the effects I wanted. This was the first time I used an under painting, and I was really pleased with the result for the most part, though next time I should fade out the colors of the under painting more to make the colorful leaves pop to a greater degree. In the past, one of the frustrating things about using white paper for paintings is that the teeth of the paper showed through and marred the overall effect I was trying to achieve. Putting down the green/brown under painting enabled me to build the trees and leaves on top of the under painting and thus achieve a greater illusion of depth. The viewer can see the green poking through in parts of the painting to look like real nature. The big lesson I did learn for improvement with this painting, is that I should use an under painting for the leaves as well. 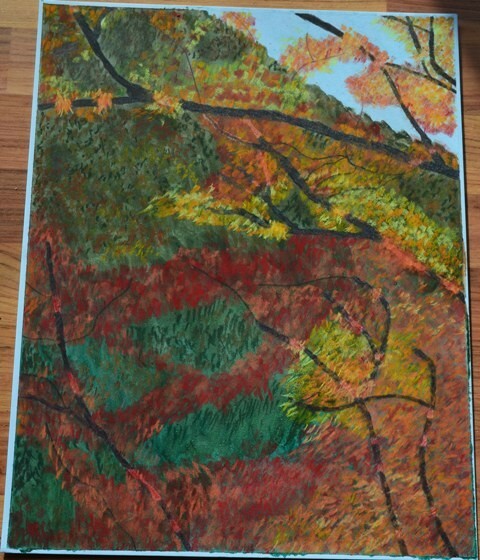 This became readily apparent when I started to apply the pastels for the leaves. I prefer hard pastels, because I personally find soft pastels to be rather messy. Even though the pastels are hard, they have varying degrees of hardness and softness. The whites, yellows, and even the oranges to a certain degree were reasonably soft and therefore easy to build up layers of color to produce realistic-looking leaves. I ran into trouble with the red pastels though. That color was substantially harder and it was more difficult to apply the red color to the existing under painting. The reds didn’t pop the way I wanted them to, unlike the yellows and oranges, because they didn’t layer well. It was also more apparent for parts of the painting where the leaves overlaid branches. I initially used masking fluid to block out the tree branches before applying the under painting, so when the fluid was removed, the paper was white. Due to the hardness of the pastels, it didn’t build up layers of color easily and the whiteness of the paper can be seen behind parts of the painting. Overall though, I was rather pleased with this effort, since it was the first one like it that I painted. I think I mirrored the reference photo well enough (though it wasn’t a complete duplication), and captured the brilliant reds, oranges and yellows of this landscape. This is the reference photo used for the painting. It was taken in Bukhansan National Park on a fine sunny October afternoon. The park is located within the Greater Seoul Metropolitan Area, which makes it readily accessible for urban hikers. Visitors can easily reach the park by taking subway Line 3 to Gupabal station, exit 1 and then Bus 704 or 34 to Bukhansan National Park. Just follow the hordes of people in hiking gear to the trailhead and follow the signs for the trails from there. The park’s location within Seoul means that this park is convenient not just to you, but to everyone (approximately 25 million people) in the Greater Seoul Metropolitan Area. While beautiful, particularly during autumn, this is not a place for solitary hiking, so know before you go. Crowds are numerous on the weekends, though if you want to beat them as much as possible, start very early. Yes, there will be early hikers, but they are the serious hikers and not the slow family walkers. You can walk as much as you want and turn around at any point, since the trail is well marked with signs and distances. The trail can be a bit uneven and steep in places, but for the most part, the trail is suitable to regular hikers. One word of advice though. Since this park is reached via a bus and not a direct subway stop, there is a high potential for running into long lines at the main bus stop for the park. When I went, I made it to the bus stop not long after sunset, and it took me an hour to get on a bus to go to back to the subway. The smart hikers in the know walked further up the road to catch an earlier bus stop and avoid the main bus stop with the very long lines. After all, once a bus was full of people from the early stops, it would just drive by the main stop. If you like hiking and love beautiful nature (particularly in autumn), Bukhansan National Park has much to offer for hikers, nature enthusiasts and landscape artists to be inspired.